Enjoy shopping with printable sale coupon from Payless ShoeSource. Plus, save even more when you shop online. Print the coupon, visit your nearest U.S. Payless ShoeSource store and take $10 off your purchase of $30 or more. 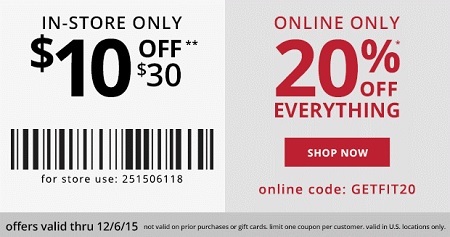 Or, take 20% off your online purchase, use promo code GETFIT20 at checkout. The in-store coupon is available through Payless ShoeSource emailing. Offer expires 12/06/2015. More details available at stores or online.